Notes: The GWR's Staines branch was opened in stages, with the northern section opening to a temporary terminus at Colnbrook on 9 August 1884.
gents’ toilet, porters’ room, ladies’ waiting room (leading into toilet), general waiting room, booking office and parcels office. The stationmaster's house, similar in architectural style, was sited on the up side of the line on Bath Road. A run-round loop was initially provided but this became redundant once the line was extended to Staines on 2 November 1885, and it was a requirement of the Board of Trade inspector that the loop should be taken out of use. It was intended that the line should, at some time, be doubled, and the level crossing at Bath Road was wide enough to accommodate two lines, but the branch always remained single- track. A second platform was provided but remained unused. A signal box stood at the back of this platform near to the north end. It was intended that the line should at some time be doubled and the level crossing at Bath Road was wide enough to accommodate two lines but the branch always remained single track. A second platform was provided but remained unused. A signal box stood at the back of this platform near to the north end. 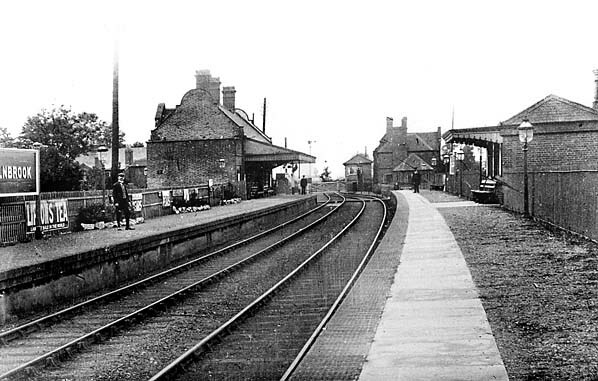 Once the GWR took control of the line in 1900 they decided to bring the passing loop and second platform into use for up trains and notified the Board of Trade of their intentions on 25 January 1904. 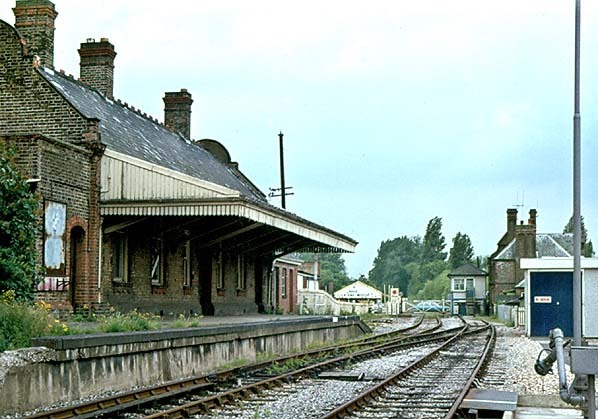 A brick waiting shelter was added halfway along the platform, and a 21-lever signal box was built at the level crossing on the up side, adjacent to the stationmaster's house; the box also contained a wheel for operating the crossing gates. The new arrangements were inspected and approved on 5 June 1904. The second platform was rarely used as the hourly service required only one train set. The only use of the loop was when a passenger train needed to pass a goods train. The other three sidings ran parallel with the goods shed on its east side; a 3-ton crane stood on the dock. In 1936/7 private sidings were added on both sides of the line. Sidings on the up side served civil engineers Edmund Nuttall while those on the down side served Swan. In the 1930s many of the rooms in the station building were converted to railway staff accommodation with only the booking office and toilets remaining in use as station facilities. In 1947 Colnbrook became a sub-railhead of Slough as part of the GWR's sundries zonal goods scheme. Additional office accommodation was required so a single-storey brick extension was added at the south end of the station building. In the 1930s many of the rooms in the station building were converted to railway staff accommodation with only the booking office and toilets remaining in use. In 1947 Colnbrook became a sub-railhead of Slough as part of the GWR's sundries zonal goods scheme. Additional office accommodation was required so a single-storey brick extension was added at the south end of the station building. BR Western Region did not install totems at the station. The passenger service was withdrawn from 29 March 1965 but the goods yard remained open until 3 January 1966. The sidings were removed later that year leaving only the private sidings in use. The signal box closed in March 1967, and the line was converted to 'one engine in steam' (with train staff), latterly worked under shunters' control. The busy road crossing was provided with flashing red traffic lights operated by the guard or shunter of a freight train. In late 1967 or early 1968 the north end of the down platform was demolished to accommodate a new siding for the recently built warehouse for Pike Brothers (later GKN Steel Stockholders). The station building remained in use as railway staff accommodation at this time. 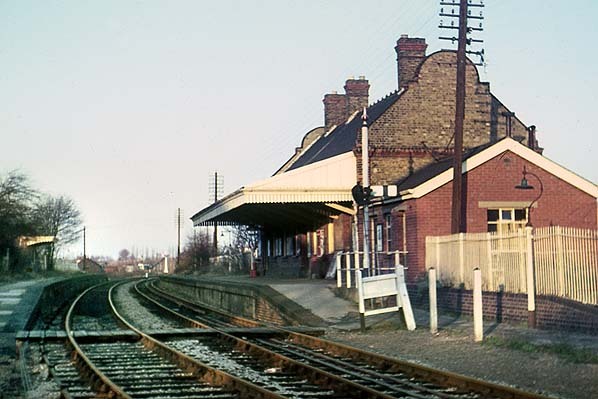 By 1975 the up platform had been demolished to allow for new industrial development of the former Edmund Nuttall, and in January 1979 the station building and signal box were demolished. In 1981 Colnbrook became the railhead when the remainder of the line was closed during the construction of the M25 motorway; a new chord from the Southern line at Staines allowed freight trains to continue using the 1964 oil terminal at Staines West. for a temporary logistics centre for the delivery, storage and assembly of materials and components related to the construction of Terminal 5, incorporating rail sidings, a bulk powder storage facility, a steel reinforcement fabrication facility, administration buildings and car and lorry parking. Although the construction work was completed in 2011 the temporary planning permission has been extended for other Heathrow-related construction projects. The north end of the site is occupied by Yeoman Aggregates with additional regular rail traffic. Beyond the Colnbrook Logistics Centre the line continues through the Total fuel depot, where there are still regular deliveries of aviation fuel, and on to the railhead on the north side of Bath Road. The fuel depot occupies the north end of the former station site. 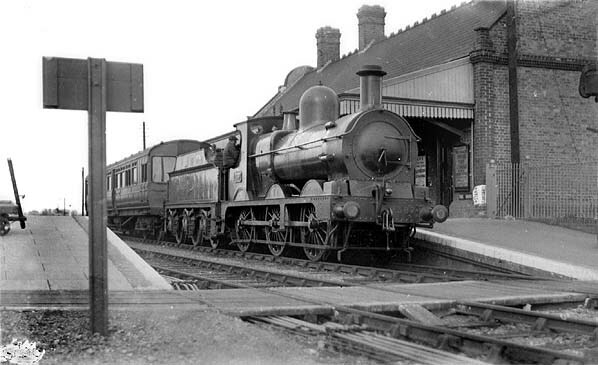 The early history of the Staines & West Drayton Railway is complicated and is a familiar story involving a campaign from local interests to improve railway connections by trading on the rivalry between two main line companies. Staines is a small market town on the London to Exeter Road at an important crossing of the River Thames. The town had lost status with the arrival of the railway age, but the opening of the Windsor, Staines & South Western Railway on 22 August 1848, linking it with London, had encouraged the growth of local industries. By the mid 1860s these included a large brewery, mustard mills, a papier-mâché factory and the world’s first linoleum works, producing the floor covering invented in the town in 1860-63 by Frederick Walton. similar schemes deposited in November 1865 became the Colnbrook Railway Act of 1866, comprising a single standard gauge line running south from the south side of the GWR station at West Drayton to the LSWR Windsor branch at Staines Moor. The proposals included a line passing below the GWR at West Drayton to allow through running between Uxbridge and Staines. Leatherhead and Dorking. This move did nothing to improve relationships with the LSWR, driving the S&WDR deeper into the clutches of the still somewhat reluctant GWR. An agreement was at last signed on 13 November 1882, which confirmed that the GWR would work and maintain it after the first six months in return for half the gross receipts. found their goods trains routed this way to and from the GWR at Greenford, but this ceased with the end of the war. Reshaping of British Railways report of March 1963. 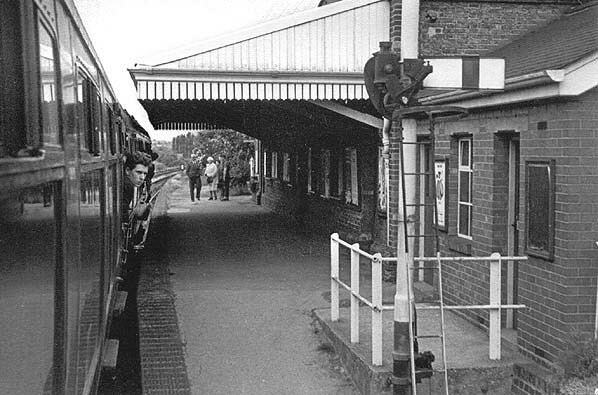 The formal proposal of closure was published on 6 September 1963, and the Secretary of State for Transport agreed on 10 September 1964 that passenger services should be withdrawn. 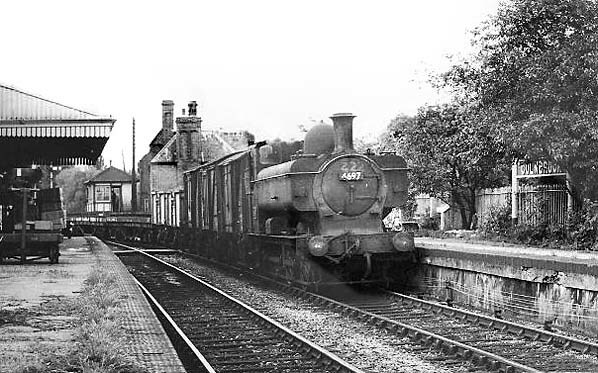 Extra workings at rush hours were discontinued in October 1964, and the last passenger train ran on Saturday 27 March 1965, Sunday workings having ceased late in 1961; the formal closure date was 29 March 1965. Alternative public transport was provided by buses following a meandering route between West Drayton and Staines. of Horton Road by junction 14 on the M25 and can be walked through the site of Poyle Halt. North of Horton Road the bed is heavily overgrown as it passes along the east side of Poyle Industrial Estate. It is passable with difficulty during the winter but virtually impassable during the summer without a machete or something similar. See a film (9mins) of the UK Railtours Concrete Cow Railtour which visited the Brentford and Colnbrook branches on 28 January 2012. 1899 1:2,500 OS map. The up platform is shown on this map but at this time it was not in use. The original signal box is seen near its north end. 1914 1:2,500 OS map showing the re-sited signal box next to the stationmaster's house on the north side of the crossing. A waiting shelter is now shown on the platform. A southbound auto-train waits in the down platform at Colnbrook station c. late 1920s. 2397 was one of 260 0-6-0 locos, designed by William Dean and built for the GWR at Swindon works between 1883 and 1899. Of the 260, only 54 locos passed to BR in 1948, the last being withdrawn in May 1957. A number of this class were requisitioned for the first and second World Wars, and they saw service as far away as China and Russia. 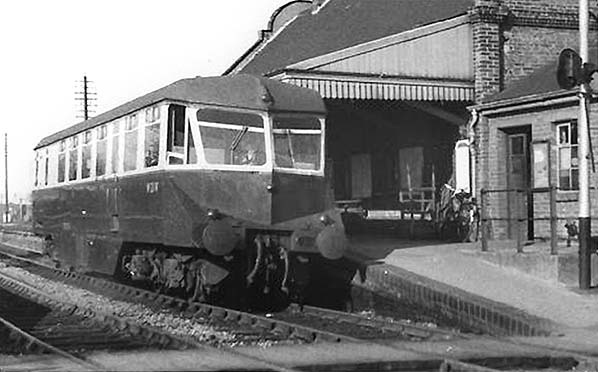 A GWR AEC-type diesel railcar stands in the down platform at Colnbrook station in the 1950s. Note the single-line apparatus on the right. A southbound passenger service at Colnbrook passes a northbound goods train in May 1959. In June 1964, with just 13 months service left, 4697 is seen hauling a branch freight through Colnbrook, denoted by the headcode of one lamp over the buffer. This loco is an ex-GWR, 57XX pannier tank, the usual class for freight traffic on the branch. This Collet-designed, Swindon built loco, entered service in February 1945 and was in service until withdrawal from 83C, Westbury shed in July 1965. 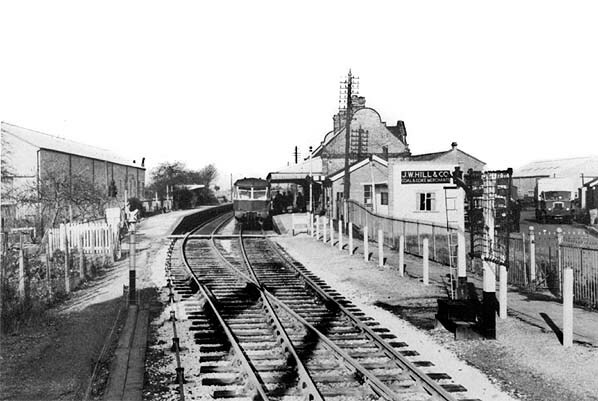 Looking north at Colnbrook station from the footpath to the up platform in November 1965, eight months after closure. The building on the right dates from 1947, when Colnbrook became a sub-railhead of Slough and more office accommodation was required. 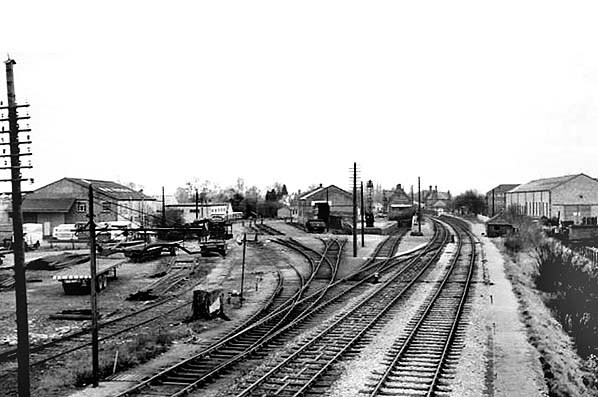 Colnbrook station looking south in August 1968. 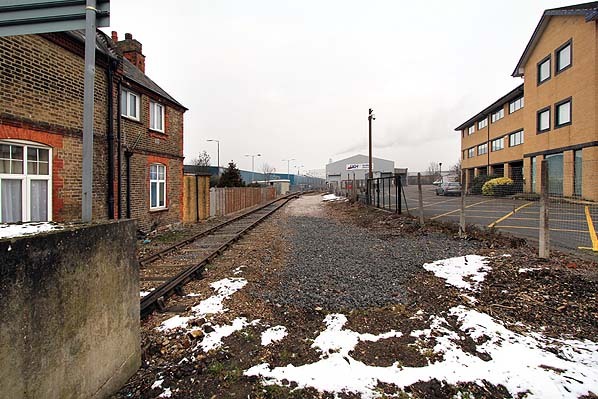 The north end of the up platform has been removed, with a new siding added to serve Pike Brothers (later GKN Steel Stockholders, now the Colnbrook Cargo Centre) who occupied a large new warehouse built on the site of the goods yard. At this time the station building was still used as accommodation for railway staff. 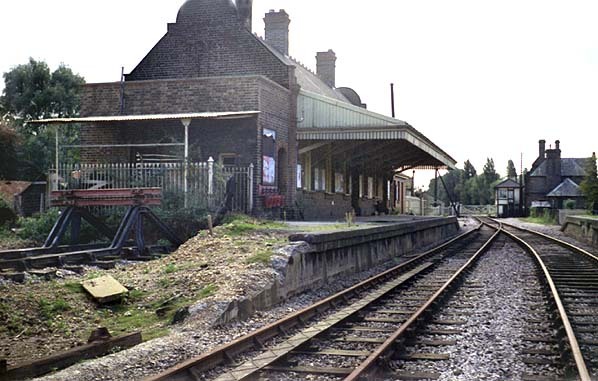 Colnbrook station looking south in June 1977. The up platform has now been demolished. 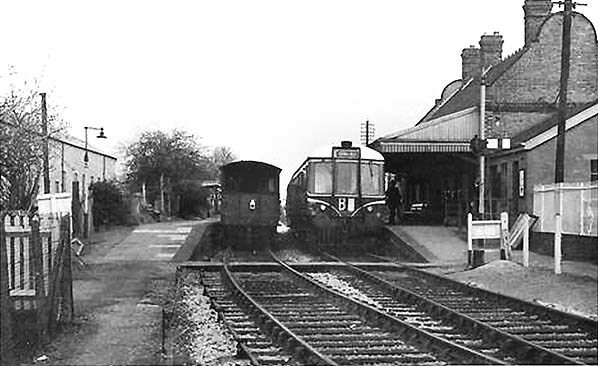 The station building and signal box survived until January 1979 when the last remnants of the station were demolished. Looking north from the level crossing towards the site of Colnbrook station in February 2012; the surviving stationmaster's house is seen on the left. The large building in the background is the UCH Colnbrook Cargo Centre (formerly rail-served GKN Steel Stockholders). The main station building was immediately in front of this structure. This is now the railhead with regular freight traffic serving the Total fuel depot seen in the background.